So I did it, the acrylics are no more! They took an absolute age to soak off but at least it's done now, what do you think? 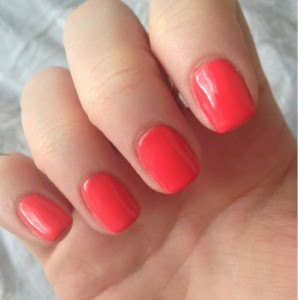 I've gone for a coral kind of colour which is perfect for spring!!! The nail technician was really surprised that my nails weren't in too bad condition and actually pretty strong. She took a lot of length off which was necessary. I have decided to go for a gel manicure to help protect them for a month or so then I will start just painting them myself. It's weird to have my actual nails again and they look so short but I am happy with them!